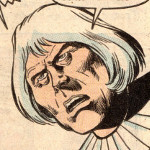 crew of "the Black Ship,"
Powers/Abilities: Nostume could travel the timestream, moving forward or backward in time, and also alter his age under some circumstances. If gravely injured and forced to take time and energy to heal himself, he may age significantly, but with time and recovery of energy and power, he could regenerate himself, reverting to a childlike form. He could anipulate and animate inanimate objects, causing rockslides, cave-in, and tremors, as well as causing roots and vines to grow and move under his control. He could transport beings across time and space, reanimate the dead as ghouls under his control, and summon and control immense creatures, such as sea serpents. (Conan the Barbarian I#177 (fb) - BTS) <"Ages" before the main story> - Nostume was shipwrecked on an island in the Western Sea. Stumbling onto a temple, he discovered and was empowered by the Well of Souls. (Conan the Barbarian I#177 (fb) - BTS) <According to Nostume> - From the dawn of time, men have feared Nostume and loathed his coming, but in the end, they all worshipped him. (Conan the Barbarian I#173 (fb) - BTS) - Nostume lived out several lifetimes and had seen "many things." (Conan the Barbarian I#177 (fb) - BTS) - Fearing that his memory might fail him with the passage of time, Nostume made a map to his island. (Conan the Barbarian I#173 (fb) - BTS) - Nostume's map was obtained by unidentified parties. It was believed to lead to great treasure, and eventually an owner tore it in half, in hopes of selling it twice. (Conan the Barbarian I#173 (fb) - BTS) - The Hyperborean Keiv obtained both copies of the map. 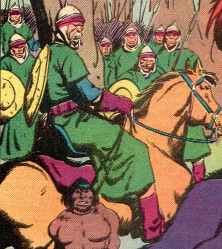 (Conan the Barbarian I#173 (fb) - BTS) - Eventually, after one of Keiv's raids of Zingara, Zingaran Captain Delmurio was sent to arrest him, unaware the Keiv had nearly a thousand Picts with him. After Delmurio's defeat, Keiv used a dagger to carve a copy of half of the map on Delmurio's chest. Delmurio allegedly later forced Keiv to flee Zingara; the original map which he had copied on Delmurio was apparently destroyed, while he lost the other half. (Conan the Barbarian I#173 (fb) - BTS) - Nostume came to be worshipped by the Pictish high priest Kawagne. (Conan the Barbarian I#172 (fb) - BTS) - Zacharus of Brythunia obtained the remaining half of the map and traveled to Pictland in hopes of gaining the other half and locating a wonderful treasure. (Conan the Barbarian I#173 - BTS) - Pictish high priest Kawagne -- who sought vengeance for Conan's ruining of the Pictish harvest ritual -- arranged with Keiv to lead Conan to Nostume, in hopes that Nostume would destroy Conan. (Conan the Barbarian I#173 - BTS) - Seeking the other half of a treasure map, Conan and Tetra confronted Keiv, whom they had heard had the other half; seemingly pressured by Conan, Keiv led the pair toward Nostume. 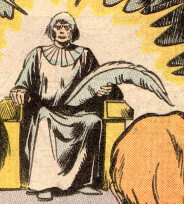 (Conan the Barbarian I#173) - Meanwhile, the Pictish high priest Kawagne sought out the youthful Nostume, warning him that Keiv was leading Conan there; Kawagne asked Nostume to punish him. (Conan the Barbarian I#173) - When Keiv arrived with Conan and Tetra, Kawagne urged Nostume to destroy them; amused by Kawagne's fear, Nostume nonetheless caused a number of roots to erupt and begin crushing Conan and Tetra when Conan threatened Nostume with his sword. Nostume was impressed that Conan struggled in silence without begging, but Delmurio -- who had trailed Keiv there -- fired an arrow into Nostume's shoulder, agonizing and distracting Nostume so that Conan could slice his way free of the root. The arrow still in his shoulder, Nostume was somewhat amused as Conan and Delmurio fought over the right to kill Keiv; deciding they all should die, Nostume dropped a large stone wall, cutting himself and Kawagne off from the others, and then caused a cave-in to kill the others. (Conan the Barbarian I#173 - BTS) - Conan -- carrying Tetra -- and Delmurio rushed out, while Keiv pounded on the stone wall, reminding Kawagne that they had had a bargain. (Conan the Barbarian I#173 (fb) - BTS) - Nostume transformed Keiv into a giant plant-creature. (Conan the Barbarian I#173) - Hours later, Nostume magically restored his collapsed cavern, after which he noted that he had never seen a man like Conan, whom he liked. Kawagne warned Nostume that Conan and Delmurio now had both halves of the map that would lead to the source of Nostume's power; however, Nostume calmly noted that if Conan pursued the map to its conclusion, he would undoubtedly be driven mad; and, if he escaped that fate, he would find Nostume waiting. Nonetheless, Nostume offered to appease his disciple by sending the now-monstrous Keiv to track down Conan and his companions and kill them all. (Conan the Barbarian I#177 (fb) - BTS) - Nostume transported the bodies of the soldiers who had recently perished at the hands of Picts while under Delmurio's command to the island of the palace around the Well of Souls and reanimated them as ghouls under his command. 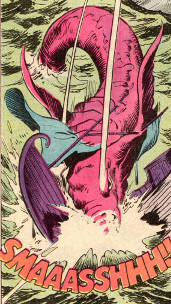 (Conan the Barbarian I#177) - After the monstrous Keiv -- now rightfully blaming Nostume for his mutation -- climbed aboard a ship carrying Conan, Delmurio, and Tetra and noted he was there to save their lives, Nostume (now more adolescent in age), appeared alongside a monstrous sea serpent that swiftly shattered the ship. (Conan the Barbarian I#177 - BTS) - Nostume's ghouls captured Delmurio, Keiv, and Tetra as they approached the island and brought them to his temple. (Conan the Barbarian I#177) - After Tetra asked whether Nostume had built the temple, Nostume (in adult form) appeared and revealed his origins within the Well of Souls; completing the telling of the legend of the Well's power, Keiv tore his bonds, and moved forward while announcing his goal of killing Nostume. At Nostume's command, the ghouls rushed Keiv and -- catching him unaware of his proximity to the Well and briefly overwhelming him with weight of numbers -- drove him into the Well. (Conan the Barbarian I#177 (fb) - BTS) - Keiv's immense size allowed him to span the walls of the Well and halt his fall. 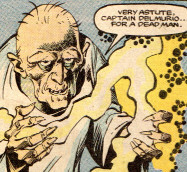 (Conan the Barbarian I#177) - Noting that the Well brought only death to the less than pure, Nostume told Delmurio that the ghouls were his own soldiers that had been slain in Pictland. Nostume then had the ghouls throw Delmurio into the Well. (Conan the Barbarian I#177 (fb) - BTS) - Delmurio landed on Keiv, which prevented him from falling into the Well's depths. (Conan the Barbarian I#177) - Nostume had Tetra brought in front of him. Intrigued by her youth and beauty, and noting that traveling the Timestream was fascinating yet lonely, he offered to spare her in exchange for certain favors. Noting she'd rather die, Tetra grabbed her dagger and slashed Nostume's face; agonized, he ordered a ghoul to shove Tetra into the Well, too. 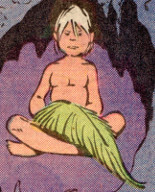 (Conan the Barbarian I#177 - BTS) - Tetra landed on Keiv as well, after which Keiv began climbing back up the Well, carrying Delmurio and Tetra with him. (Conan the Barbarian I#177) - Conan arrived in Nostume's temple, battering the ghouls and eventually dropping them all as he made his way toward Nostume's throne. Despite Nostume's warning, "you would not dare!," Conan struck Nostume with his sword. Hurt and dying, Nostume was barely able to mutter that no one had ever hurt him so before vanishing back into the Timestream. (Conan the Barbarian I#177 (fb) - BTS) - In the Timestream, Nostume lay crippled and in agony for years -- during which time he prayed for the chance to face Conan anew -- before healing his wounds, during which he adopted a greatly aged form. 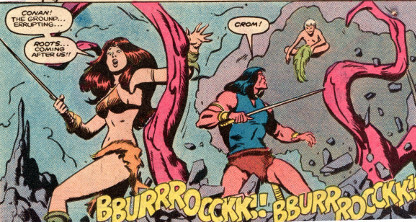 (Conan the Barbarian I#177) - Nostume returned, moments after he left; his appearance startled Tetra such that she fell back into the Well of Souls. 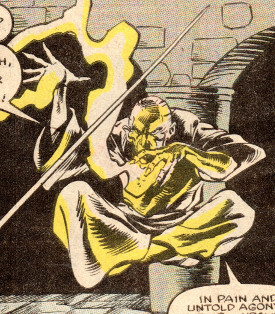 Despite his aged form, Nostume noted that he always survived and would dance on Conan's grave. Instructing Delmurio and Keiv to stay back, Conan approached Nostume, who prepared to fulfill his dreams by destroying Conan. (Conan the Barbarian I#177 - BTS) - Tetra reached the bottom of the Well of Souls, entered the "Other World," and gained the Well's power. 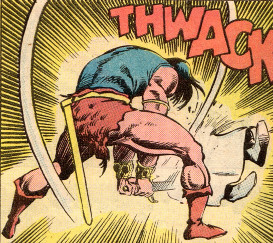 (Conan the Barbarian I#177) - Abruptly, the power vanished from Nostume, and he fell to the ground. Nostume pleaded to discuss terms of surrender, but Conan ended his life with another sword strike. Delmurio noted that he approved of Conan's terms, though he wished he could have gutted "the pig." (Conan the Barbarian I#177 - BTS) - Nostume's corpse was buried as the newly-empowered and maddened +/- corrupted Tetra leveled the temple. Comments: Created by Jim Owsley, John Buscema, and Bob Camp. Nostume referenced/invoked, "By the Black Nebula"
(Conan the Barbarian I#173) - Captain Delmurio led 100 Zingaran soldiers into Pictland in hopes of capturing or slaying Keiv. Seeking Keiv's information, Conan manipulated a vast Pict horde into encountering and attacking the soldiers. Delumiro escaped this fate, but he was apparently the only one (beyond the pair already slain by Tetra). (Conan the Barbarian I#177 (fb) - BTS) - Nostume transported the bodies of the soldiers to the island of the palace around the Well of Souls and reanimated them as ghouls under his command. 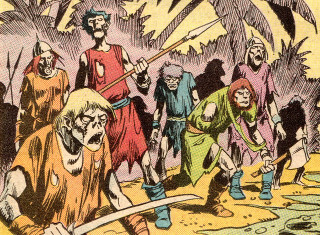 (Conan the Barbarian I#177) - Nostume's ghouls captured Delmurio, Keiv, and Tetra as they approached the island and brought them to his temple. At Nostume's command, the ghouls rushed Keiv, and -- catching him unaware of his proximity to the Well and briefly overwhelming him with weight of numbers -- drove him into the Well. (Conan the Barbarian I#177) - Noting that the Well brought only death to the less than pure, Nostume had the ghouls throw Delmurio into the Well next after telling him that the ghouls were his own soldiers that had been slain in Pictland. (Conan the Barbarian I#177 (fb) - BTS) - Delmurio landed on Keiv, preventing him from falling into the Well's depths. (Conan the Barbarian I#177) - After Tetra slashed Nostume's face with her dagger; he ordered a ghoul to shove Tetra into the Well, too. (Conan the Barbarian I#177 - BTS) - Tetra landed on Keiv as well, after which he began climbing back up the Well, carrying Delmurio and Tetra with him. The immense sea serpent dwarfed a large sailing ship. 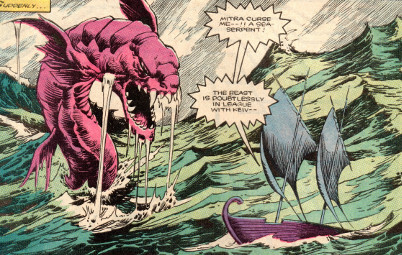 (Conan the Barbarian I#177) - After the monstrous Keiv climbed aboard a ship carrying Conan, Delmurio, and Tetra and noted he was there to save their lives, an adolescent-appearing Nostume, appeared alongside a monstrous sea serpent. While Delmurio suspected the beast to be in league with Keiv, Nostume announced it was totally within his control as were the fates of all those on the ship. After Nostume explained that he had come that day not seeking worship but death, the serpent swiftly shattered the ship.